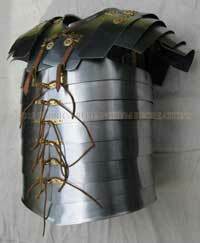 The term, lorica segmentata, is relatively modern, coined to describe this particular type of Roman armor. 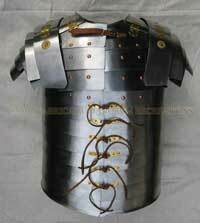 More recent studies suggest that the term "lorica laminata? 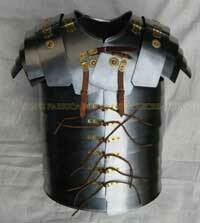 may be more correct, but because of a long tradition of use the phrase "lorica segmentata? has become the embedded term used by historians and reenactors alike. The lorica segmentata was in use for only a relatively short period of time. The various versions are named after the places they were first found, e.g. 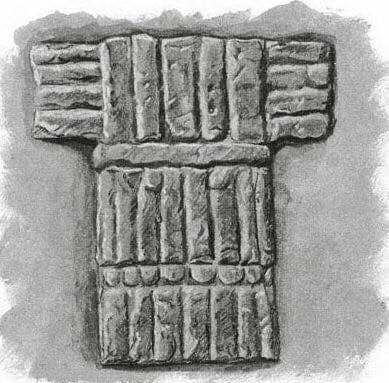 : the "Kalkriese" segmentata is named after the site where pieces of it were found: Kalkriese, Germany (it was found at the site of the Varian disaster which happened in 9AD at Kalkriese). 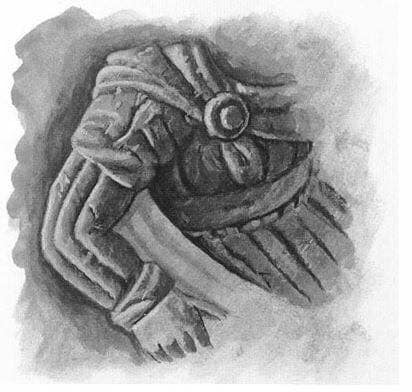 This is the earliest that lorica segmentata has been known to have been used and it is very incomplete" it is different enough from the Corbridge models. The "Corbridge" segmentata, early 1st Cen. AD through early 2nd Cen. AD was found at Corbridge, England. 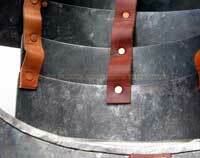 The lorica segmentata was made from strips of iron put together with leather strps in an overlapping fashion. 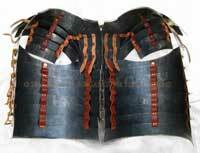 It's these leather strips that give the lorica segmentata it's strength and flexibility, and thus is a great defence against enemy swords and stabbing weapons. With this flexibility the soldier could move freely and use his shield and sword without the armor getting in his way. Some photos of a hyper-authentic reproduction Corbridge "A" lorica segmentata made by Matt Lukes. 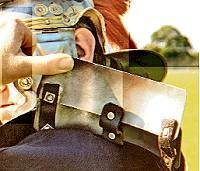 Matt is one of the premier craftsman in the Roman reenactment world. 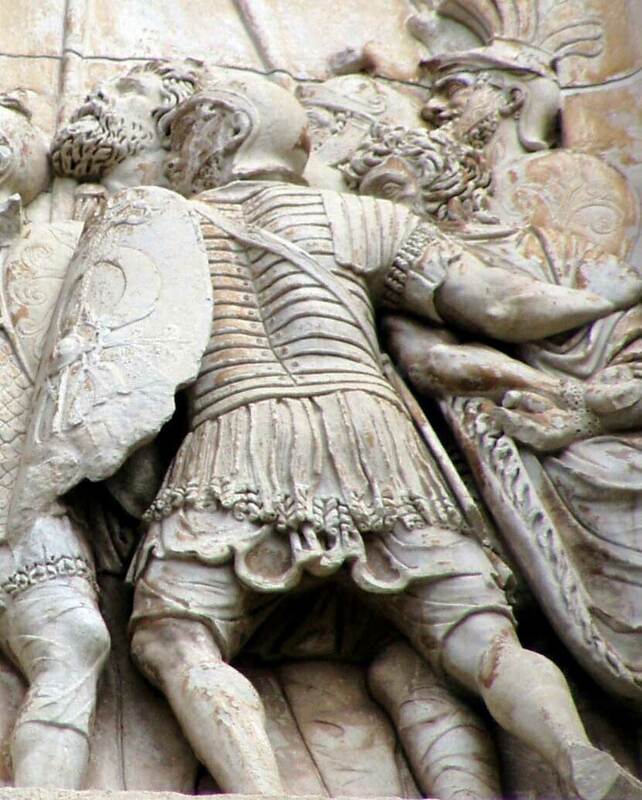 Here are a few photos of Roman friezes that show the lorica segmentata being worn by soldiers in Roman times. 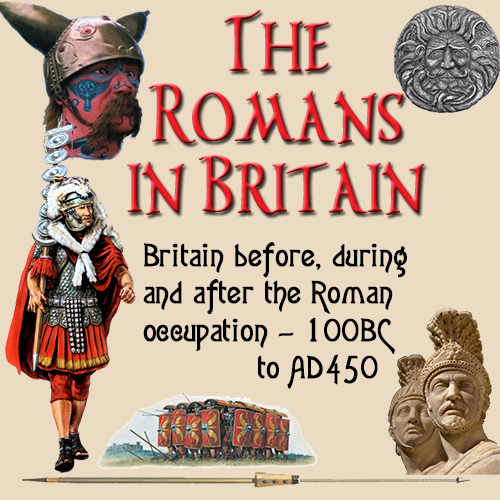 This GREAT bit on the subarmalis is from the The Roman Recruit website and is used with the kind permission of the author, Paul Elliott. Please visit Paul's site and give it a look! 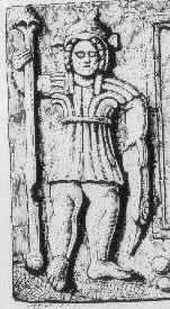 Above Sculpture of Mars the god of war, on an inscription from the fort at Bremenium. Mars wears what looks like a subarmalis. 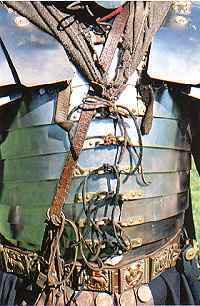 The subarmalis is a padded jacket worn beneath the lorica hamata (chainmail) or the lorica segmentata. It cushions a blow from an enemy, hopefully preventing broken bones, ruptured organs and internal bleeding, even though the metal armour on top has actually deflected the blade. Graham Sumner argues for a linen garment, with cells stuffed with padding, covered by a waterproofed layer of goatskin. 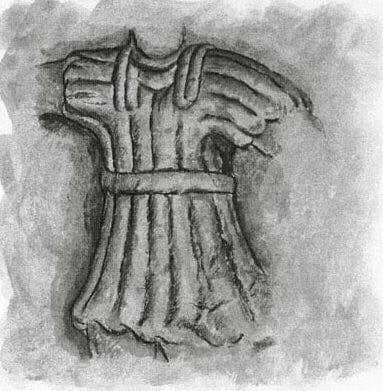 The subarmalis can sometimes be seen peeking out from beneath armour on wall-paintings and in mosaics of the period, but no physical examples have survived. Typically, the subarmalis is constructed in linen (those depicted are white, which often denotes the use of undyed linen), either a score or more layers glued together, or two layers with wool packed between them and then quilted. Both create a viable 'dead' space behind the ringmail which provides that vital protection from blunt trauma. Obviously, wearing a subarmalis is very hot and heavy to wear — especially when you add on the armour and helmet, and then... all of the weaponry and a shield! 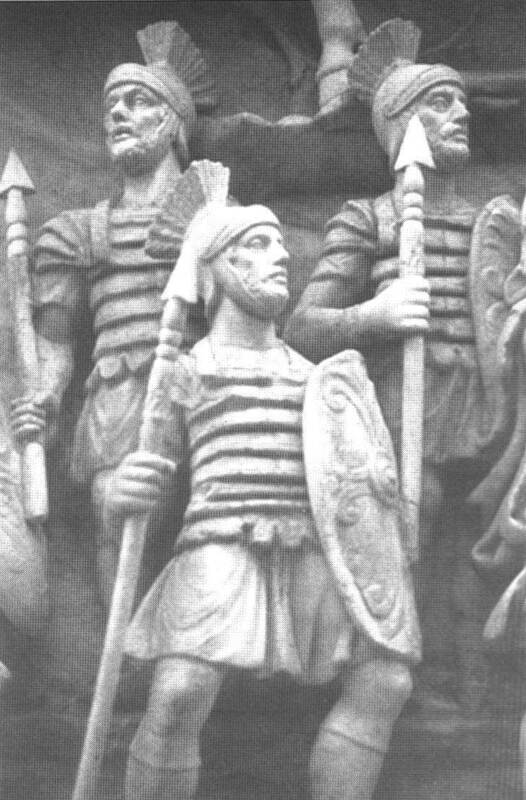 Above image of a subarmalis, from a sculpture in Volterra Italy, possibly shows a subarmalis worn as body armour in its own right. However, the subarmalis is necessary and without a subarmalis, a blow from a weapon could (and probably would) create "shock" injuries such as the aforementioned broken bones, ruptured organs and internal bleeding.